The 2008 Noida Double Murder Case is one of the most talked about and highly controversial murder case. Lots of things have been said publicly by prominent personalities. Many people have put forth their views on the same and now Meghna Gulzar has come up with a motion film on the same subject, titled, TALVAR. It is a dramatization of the real life events revolving around the Aarushi Talwar murder case investigation. After having read so many views and opinions on leading dailies, I was pretty much high on the expectations from the film. With an ensemble of some solid and proven performers, I was all the more intrigued on how such a sensitive and mind boggling case would be shown on the big screen. Much to my expectation, the movie did a fabulous job with respect to putting across and highlighting the murder without much fuss and in a subtle yet effective way. I was simply engrossed in a way the actors have played their part with a tight control on the body language which is highly important while portraying an incident that has actually happened. The movie shows the multiple viewpoint of the investigating officers and offers a perfect dramatization of those backing them with facts. Right from the start, if you are keenly watching the film, you will figure out the minute differences which plays a major role in the investigation shown in the film. The movie primarily shows the dogged pursuit of the investigating officer played by Irrfan Khan towards finding the actual culprit. What did strike to me was, how the police, the media and the in-fighting among the investigative agency play their part in finding facts and presenting them. For me, as a viewer, the film has done justice exceedingly well in almost all the departments. Right from the screenplay, to the background score, to the dialogues, to the editing, to the acting and finally to the direction. Each and every department has contributed equally in coming out with a product that is actually hard hitting in some way or the other. The other thing which kept me engaged in the movie is the suspense that has been maintained at each and every stage. For not even once, I felt that I could foresee or predict the next scene. Or rather if I could, I would have been sitting next to Vishal Bhardwaj, the script writer of the movie and assisting him, isn’t it? This, really is highly commendable. Of course there are some brilliant performances, but Irrfan Khan simply takes the cake away with his stellar on screen presence, dialogue delivery and his overall strong and effective performance. 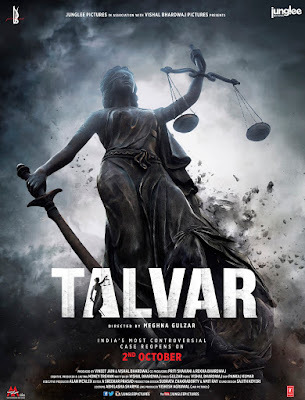 Talvar kept me on the edge of the seat as it took me through some hard hitting performances along with plenty of questions to take home and ponder upon. Overall, I had a superb movie watching experience with much substance to make it one of the best movies that I have ever seen this year. Ratings: ****/5 – A must watch film with family and friends for a gripping story and stellar performances. Not to be missed under any circumstances. See no evil, hear no evil, speak no evil — this maxim is supposed to keep you safe. The couple saw nothing, heard nothing and all they said was that they were grieving, innocent parents. By the end of Talvar, they're in jail.It's more of a much-needed social document than a film. You must know that this could be your story and if it isn't, that's because you're lucky. Not because crime happens in other people's lives or because the police are there to protect you.We will probably never know who killed Aarushi and Hemraj — not because it was perfectly planned and executed, but because the case was comprehensively mangled while being investigated. From the movie, one thing is very clear that it is a botched up investigation. Also, I think it is only based on the findings of the such an investigation that arrests have taken place. So it is safe to think that and as you said it 'we will never know who killed Aarushi and Hemraj.